People dressed as Vikings marched through Lerwick to recreate its ancient Viking past. 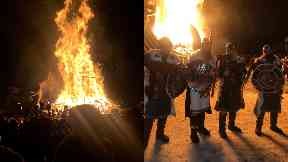 Thousands of people have gathered for the world-famous Up Helly Aa fire festival on Shetland. 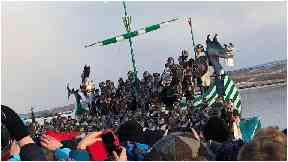 The procession is led by the Guizer Jarl, or chief guizer, and culminates in a replica longboat being set alight. This year the boat has been decorated in the distinctive green and white hoops of Celtic at the behest of Guizer Jarl John Nicolson, a supporter of the football club. 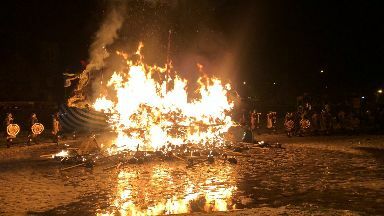 Volunteers are responsible for the building of the galley boat and the production of more than 1000 torches. The 2019 Chief Viking John Nicolson is the fourth member of his family to take up the role. The Guizer Jarl, or chief guizer, gets the honour of choosing the colour of the ship and Mr Nicolson, as a lifelong supporter of Celtic football club, opted for distinctive green and white. The festival stems from the 1870s when a group of young local men wanted to put new ideas into Shetland's Christmas celebrations.